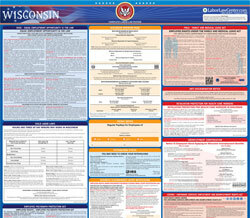 The Employee Protections Against Use of Honesty Testing Devices is a miscellaneous law poster by the Wisconsin Department Of Workforce Development. This poster is mandatory for some employers, including employers who use honesty testing devices. This poster must be posted in a conspicuous place by all employers that do honesty testing in the workplace so employees can see it. This poster describes the times that lie detector tests can be used and when it is forbidden in the workplace. It appears you don't have a PDF plugin for this browser. Please see the link below to download wisconsin-erd-10861-p.pdf. notices to employees are customarily posted. a test or objects to its use. loss or injury to a business if the employee is a reasonable suspect. security services, alarm systems, and who manufacture, distribute or sell controlled substances. the right to discontinue a test at any time and the right to advance written notice of the questions to be asked. testing occurred, at one of the offices below.